Hooded sweatshirt trends for 2017 aren’t all that different from last year with the exception of more options and more colors. The basic hoodie will always be a staple because it’s traditional, affordable, and fits no matter the cause be it our door use for company employees or team sweatshirts for a team sport. They are available in various weight and a ton of colors. The traditional cotton poly blend hoodie is here to stay. Sublimated hoodies are coming on strong. These are a hooded sweatshirt trend that is just now taking off in the midwest. The have a textured look or pattern that is created through a dye sublimation process. These are typically made of a performance polyester moisture wicking material and some are light weight and others have a great lining to add warmth and weight. These come as a full body design or sometimes just the sleeves have the patterned design. A truly great sweatshirt. The only downside to a sublimated hooded sweatshirt is the pattern and how it affects a graphic. Certain colors and graphics might blend with the hoodie pattern and be hard to see. The whole purpose of custom hoodies is to market something so depending on your purpose these might not be right for you. Performance poly sweatshirts either solid colored or with contrast piping or accents. These are great for marketing a brand and team sports. They have a very classy look and with crips dimensions have a professional look that is great for being causal while looking sporty. Because of their performance properties they are popular among team sports as a marketing piece for athletes to wear to and from games and in just use while bopping around town. Since these are solid colored in nature printing any graphic or message in any color works fine. With the performance material does come a price increase. Full zip light weight soft hoodies are an ever growing hooded sweatshirt trend. Especially among women who don’t want to fuss with their hair a full zip eliminates all the hassle. These are light weight and fashionable that come in both solid standard colors and a few unique colors as well. Actually popular among men and women because that present more of a light weight jacket purpose than a full blown swaetshirt. Easily printable but to keep expense low a left chest print works best as opposed to a design that spans the zipper. The technology is making great strides in the apparel market and now consumers have more options than ever and can choose between newer colors, newer materials as well as newer styles. So when it comes to hooded sweatshirt trends there really is an option for any ocassion. We custom print hoodies for just about every type of industry. While team sports is the largest buyer, outdoor service businesses like tree services, lawn services, pest control services, and other types of businesses that have employees out in the elements are the 2nd largest buyers. Kirkwood Trading Company specializes in screenprinting custom logo wear. 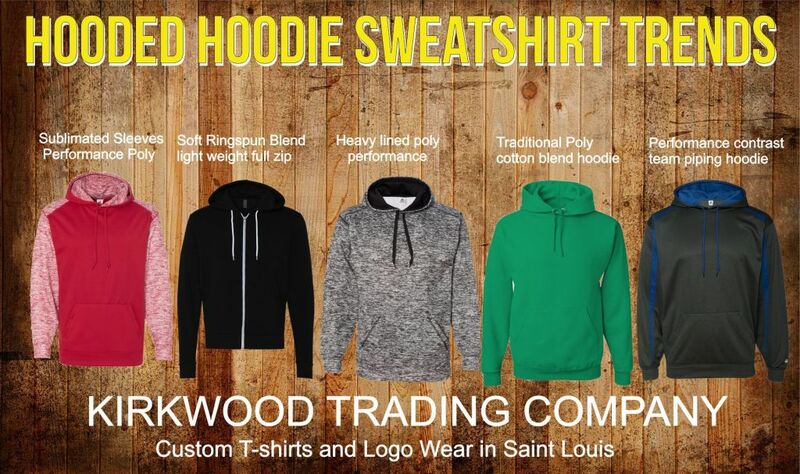 We carry a full line of these hooded sweatshirt trends and will be happy to discuss options and pricing with you to see what makes the best fit for you needs.